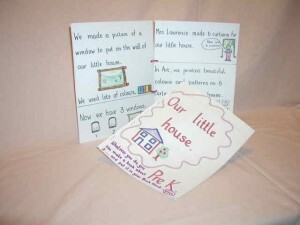 Case Study, Pre K - Show Me WOW! Background. The classroom had nowhere that stimulated imaginative play that would give opportunities for very young children to expand and develop their speaking and listening language skills. They needed a home corner that could later develop into a shop, a hospital, a dentistry, a space ship. The teacher re organised the shelves to cordon off a corner area, adding small chairs and a table, a collection of cups and saucers and bowl of plastic fruit, an old television, a doll in a basket. Reading. 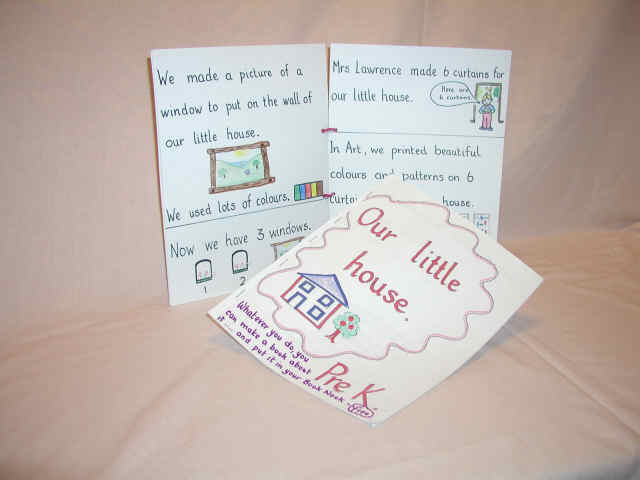 The book “Our little house” had its own hook in the actual little house and was constantly “read”..to the extent we had to make a photo copy so more children could “read” it. Counting in twos for working out how many curtains needed for 3 windows. 12 paper plates to be arranged on the three shelves. How many on each shelf? Printing on the plain white curtains with pieces of sponge. Drawing and colouring an extra window with a view to the outside…this to be pinned on the classroom wall. Drawing and colouring shelves to go on the classroom wall and on which would be stuck paper plates. Using paper cups and straws and coloured paper to make potted plants for a window box. Drawing and labeling in French a knife and fork on the paper plates. Family groupings, social interaction, empathy, co operation with others, sharing, group work, organisation skills etc etc. This is so great. Please email me more on thematic approach towards teaching young children. It is really a great way for children to lean and have fun in learning.